For over 75 years now, the E.G.O single pole capillary thermostats have proved effective in regulating and controlling heated appliances. The growing demand over the years has resulted in an increase in production to meet the needs of customers through the globe. By the end of 1998 E.G.O had supplied millions of single pole thermostats to customers in the Domestic, Commercial and Industrial market sectors. Operation - The principal by which a single pole capillary thermostat operates is that of liquid expansion. The hydraulic thermal system (Diastat) consists of the sensor, the capillary tube and the diaphragm. When the sensor heats up, the liquid expands through the capillary tube into the diaphragm where the working stroke is produced, By generating the working stroke, a snap-action switch is actuated which opens or closes the electrical circuit. 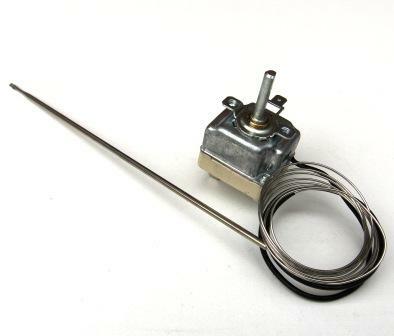 These single pole capillary thermostats are intended to regulate the temperatures of liquid, gases or solids. 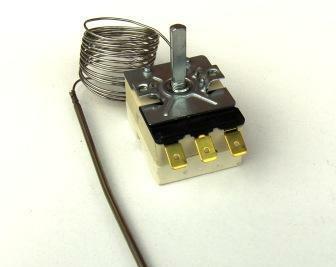 The above thermostat is a typical E.G.O Capillary thermostat, with change over function - Type: 55.132series. The above thermostat is an older thermostat series E.G.O Capillary thermostat, - Type: 55.190series. 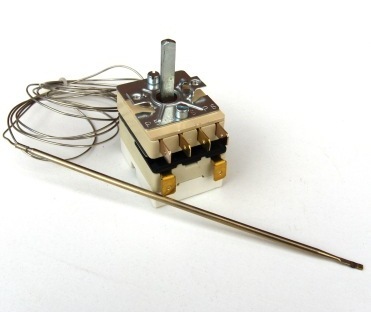 The above thermostat is a typical E.G.O Capillary thermostat, with a built in auxiliary switch - Type: 55.136series. 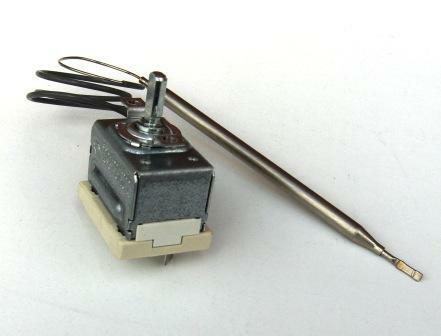 The above thermostat is the last series thermostat - Type: 55.17series, which is offered for high volume applications.